Cornwall has inspired many great pieces of literature and has been the setting for many dramatic productions. The magnificent coastline, atmospheric moors, wooded creeks, ancient villages and historic mansions all provide an ideal setting for writers and film producers, fuelling their imagination with striking imagery. Daphne Du Maurier is famous for her novels and for her association with Cornwall. Born on the 13th May 1907, her family bought the house, Ferryside, at Fowey in 1926, where she was to spend a large part of her life. In 1943, they left, remaining within the Fowey area and rented the mansion of Menabilly from the Rashleigh family, famous for their mineralogical interests. Menabilly was to feature in Rebecca, the Manderley of the novel; and in My Cousin Rachel and The King's General. The Du Maurier family continued to reside at Menabilly until 1969. In 1969 Daphne Du Maurier moved to Kilmarth, where she was to spend the last years of her life. This house is described in her book, The House on the Strand. Her books include: The King's General; Frenchman's Creek; Jamaica Inn; The House on the Strand; Rebecca; My Cousin Rachel; The Loving Spirit; and Castle Dor (written with Sir Arthur Quiller-Couch). Daphne Du Maurier died in April 1989. 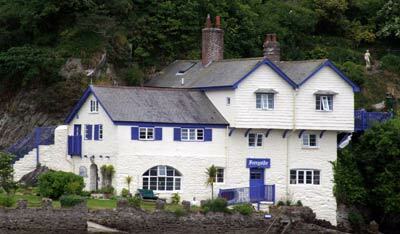 Her rich literary heritage is celebrated annually in Fowey during May. television with many of them being shown on German TV. Her books include: The Shell Seekers; The Day of the Storm; and Under Gemini. dramatised for television. His books include: Ross Poldark; Demelza; Warleggan; and The Black Moon. Sharon Tregenza is a Cornish children's writer - born and brought up in Penzance. A few months ago she won the prestigious Kelpie Award for children's literature with her children's novel "Tarantula Tide" and she's published over 400 stories, articles and poems worldwide.